Is Vanilla Reload Finally Dead? Many of you may have received an e-mail from American Express about your Bluebird accounts this afternoon. If you have not yet, it is probably coming. Brace yourselves: it’s not good. InComm Vanilla Reload PIN Package is one of the many ways to add money to your Bluebird account. Starting April 1, 2015, the Incomm Vanilla Reload PIN Package will no longer be available for purchase. Any previously purchased Vanilla Reload can still be added to any Bluebird account. So what does this mean? From my personal interpretation (which reserves the right to be wrong), this forewarns one of two things. 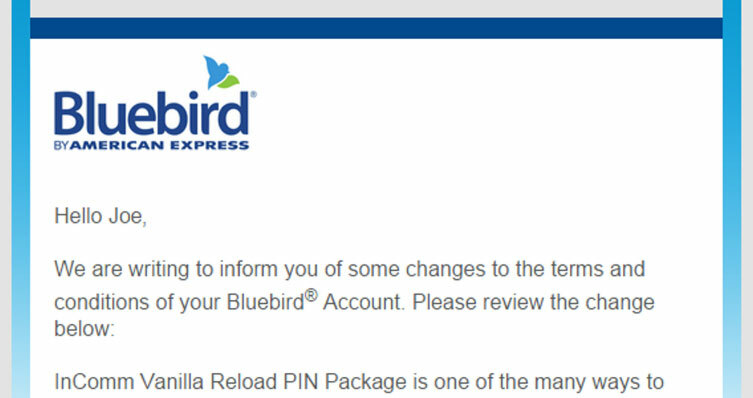 Either American Express will no longer honor Vanilla Reloads as a way to reload your Bluebird Card after April 1, or the Vanilla Reload that we have loved so dearly is completely going away next spring. Currently, the Vanilla Reload website still has the American Express Serve logo on the front page. Yet, I am choosing to interpret it as the latter. The sky could be, in fact, falling. Is this a big deal? Or with many other ways to spend, is this one door closing before another window opens? Let me know your thoughts, while I mourn the loss of our dear friend: the Vanilla Reload.